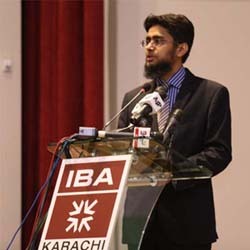 Mr. Ahmed Ali Siddiqui, Director IBA Centre for Excellence in Islamic Finance has been recognized amongst the most prominent business leaders in the Islamic finance industry by 'Islamica 500' - 2017, an annual publication entailing biographical details of 500 of the world's most prominent and influential personalities in the Islamic World and economy. These leading figures are from the science, business, finance, international affairs, politics, media and law i.e. areas that are having impact in the Islamic Economy. The publication is compiled by the ISFIN Institute, the Academic & Training subsidiary of ISFIN. ISFIN is the World's leading advisory for Islamic markets. ISFIN is operating in 75 countries across 5 continents as an independent consultancy firm.